In 0 times table multiplication chart we will learn that whatever we multiply by 0 the answer will always be 0. 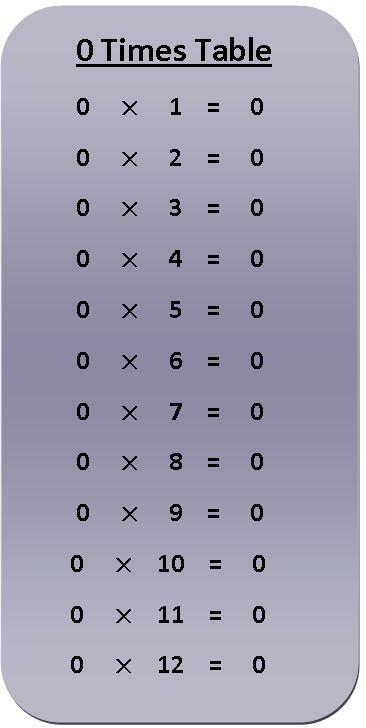 Print out the multiplication table of 0 and hang it on your wall which will help you to learn 0 times tables. Click Here to download the 0 times table multiplication chart and then print it out. Let’s practice free multiplication table from the below exercise after learning 0 times table multiplication chart. 0 × 14 = …………. . 0 × 1 = …………. .
0 × 21 = …………. . 0 × 7 = …………. .
0 × 11 = …………. . 0 × 9 = …………. .
0 × 18 = …………. . 0 × 0 = …………. .
0 × 25 = …………. . 0 × 5 = …………. .
0 × 16 = …………. . 0 × 3 = …………. .
0 × 24 = …………. . 0 × 8 = …………. .
0 × 18 = …………. . 0 × 6 = …………. .
0 × 15 = …………. . 0 × 2 = …………. .
0 × 12 = …………. . 0 × 4 = …………. .
0 × 10 = …………. . 0 × 2 = …………. .
0 × 19 = …………. . 0 × 9 = …………. .